In 1989, following the fall of the Berlin wall, the United States Congress authorized and funded the creation of Enterprise Funds aimed at supporting private sector development in two formerly communist nations of Eastern Europe. The Enterprise Funds were organized as private, not-for-profit corporations run by independent non-governmental boards of businessmen and women who managed and invested the grants received from the United States Agency for International Development (USAID). The Enterprise Funds’ mandates were to invest in small and medium sized corporations in Hungary and Poland which did not have access to capital. Following the fall of the Soviet Union in 1991, several other funds were established for Russia, Albania, the Baltics, Bulgaria, Central Asia, the Czech-Slovak Republics, Romania, and the Western newly independent states, with grants ranging from $30 million to $340 million. In all, the United States Congress appropriated over $1.3 billion in grants to 10 Enterprise Funds between 1989 and 1995. • Expanding cultural, educational, and scientific exchanges through the establishment of Fulbright commissions, reciprocal cultural centers, scholarship programs, and other activities. Members of the National Security Council staff, at that time, were also instrumental in the passing of the SEED Act, including now Secretary of State Condoleezza Rice and now Assistant Secretary of State for European Affairs Dan Fried. Following the authorization of the Enterprise Funds in 1989, the U.S. Government selected individuals with business and government experience from both the United States and the respective host country to serve on the board of each Enterprise Fund. Individuals with proven success in banking and venture capital investment were recruited from the highest levels of the business community to serve on the boards. According to a 1999 Government Accountability Office (GAO) Report: “[t]he Fund boards are responsible for establishing their own operating and investment policies and directing their corporate affairs in accordance with U.S. legislation and grant agreements. The Fund’s senior management is generally American. The Fund’s investment staffs, including senior investment officers and other investment professionals, are comprised of Americans, hostcountry, and third-country national employees.”2 This structure allowed oversight and decision-making to remain in the control of American board members while benefiting from on-the-ground knowledge and cultural understanding of in-country board members and staff. Each Enterprise Fund was registered as a private, not-for-profit (501(c)(3)), non-stock corporation in the United States (mainly Delaware). The members of the Corporation (the U.S. Directors) stand in place of the shareholders and the members elect the Directors every three years. An operating agreement was signed with the USAID that required the Enterprise Funds to undergo routine audits but which allowed the Enterprise Funds to operate independent from government control or influence. In fact, the Enterprise Funds have been so successful that in the particular case of the Polish-American Enterprise Fund, an initial USAID grant of $240 million in 1990 reached a total value of $360 million by 1999. The Polish Fund had invested in several dozen enterprises, a bank, a mortgage company, and a micro loan fund and had created a private management company to invest its funds. In the late 1990s, the Board decided to liquidate the Polish Fund. One half of its original investment, $120 million, was returned to the United States Treasury, a first for a United States foreign assistance program, and the rest was used to endow the Polish American Freedom Foundation, an initiative to provide grants for civil society building in Poland and surrounding countries. One of the Foundation’s best investments was Fundusz Mikro, a micro loan initiative that has distributed 93,000 micro loans to 43,000 clients totaling $250 million over 12 years. • Training bank personnel in credit risk evaluation. In addition, Enterprise Funds have invested or reinvested in over 500 small and medium sized enterprises in host countries. Every dollar invested in these businesses has helped attract an additional two dollars from local and foreign investors for new technologies and development capital and has created employment opportunities for approximately 250,000 people. Building on the success of the Enterprise Funds and the precedent of public funding for such initiatives, the Cuba Study Group proposes the creation of the Cuban Enterprise Fund (the “Fund”) to assist in the creation of private enterprise in Cuba as soon as law permits. The Fund would follow a similar institutional structure as previous Enterprise Funds while drawing on additional sources of capital funding. The Fund would be incorporated as a not-for-profit corporation with no shareholders. A Board of Directors would be appointed by the donor institutions and in accordance with their contributions to the Fund. Directors would be selected for their knowledge and experience in venture capital investment and not for political considerations. The Board would consist of five members from donor nations (or regions) as well as four members from within Cuba. The Cuba Study Group recognizes the obstacles in both United States and Cuban legislation that would make the implementation of the Fund impossible at this time. However, recognizing that the transfer of power in Cuba represents a genuine window of opportunity and, given the Cuba Study Group’s belief in the importance of laying options on the table for the consideration of possible reformers within the government, we propose that the groundwork be laid in anticipation of the inevitable change that will occur in Cuba. By preparing this important initiative in anticipation of change, we better serve the Cuban people and their chances of success and prosperity following a transition. The most dynamic sector in the former communist nations of Europe, the former Soviet Union, Vietnam, and China have been small and medium sized businesses which have been responsible for generating approximately 60% of their gross domestic product. It is generally the case in nations in transition that neither the former banking system, which had primarily served large corporations, nor the new private domestic and foreign banks, serve the small enterprise market. This is due in great part to the fact that these new, domestic small and medium sized businesses present a greater perceived risk and higher transactional costs due to the small size of their loans and lack of collateral. Inevitably, this will be the case in Cuba as well. The Cuban Enterprise Fund would service this segment of the Cuban economy that ultimately will be underserved, yet is so important for the economic success of Cuba. In addition to the United States Government’s initiative in financing the Enterprise Funds of Europe and Asia, it has specifically recognized the importance of assisting in the development of private enterprise in Cuba. Chapter IV of the Second Report of the Commission for Assistance to a Free Cuba presented to the President in July 20068 clearly states the important role the United States, the international community, and Cubans abroad can play in assisting in the economic development of Cuba. More specifically, the section titled “Encourage Small Business Development” sets out specific ways in which the United States could assist in encouraging private enterprise in Cuba. Furthermore, the report highlights the importance of preparing “well in advance” to assist the Cuban Transitional Government so as to be in a position “to offer assistance immediately.”9 Finally, the report highlights the importance of building “a broader international effort starting now, in the planning phase.”10 The Cuba Study Group believes that this proposal builds on this commitment by the United States government through the implementation of foreign assistance programs with a proven track record within the United States government, principally the Enterprise Fund model. • Hungary, Poland, the Czech Republic and other European nations. Cuba has a very small private sector and a very primitive financial sector with a total lack of financing for small and medium sized enterprises; however, there are plenty of investment opportunities, especially in the service sector (retail trade, services to tourism, personal and commercial services, etc.). This is in contrast to some Eastern European nations where there was a small, yet significant, private sector accounting for approximately 10% of the economy in some instances. This fact highlights the challenges Cuba will face and the importance of making training, technical assistance, and mentorship available to Cuban entrepreneurs, in addition to making capital available to start or expand small and medium sized businesses. Eastern European nations such as Poland, Hungary, and the Czech Republic that saw the benefits of the United States Enterprise Funds, and that continue to do so today, are in a unique position to understand the important role that the Cuban Enterprise Fund could play during Cuba’s transition. The Fund represents a unique opportunity for these nations to now take on a leadership role and assist a country that will face many of the same challenges they once did. While this proposal relies mainly on the support and financing of governments and international financial institutions, it recognizes the important role of private investments. The Cuban Enterprise Fund will be called upon to leverage itself with parallel private investments. The Polish-American Enterprise Fund provides a highly successful model for managing and attracting private investments. 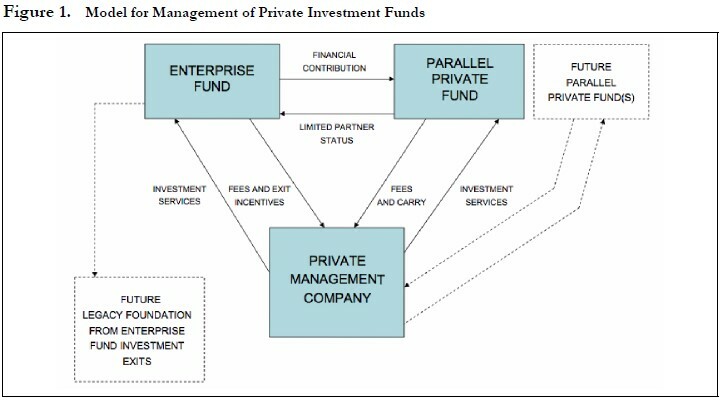 It established an investment management company which attracted private institutional money to invest alongside the Polish Enterprise Fund (See Figure 1). Over time, the Polish Fund was re-paid and the investment company continues to invest funds from private sources. The Cuban-American community is a natural source of private investment in this case. In addition, Cuban- American investment would send an important message to Cubans on the island, that the exile community is interested in being a transitional asset, not a transitional obstacle. The Board of the Fund would have complete autonomy to decide where and when to make investments, separate from political considerations or pressures from the Cuba Study Group, governments, or donor institutions. The Board would approve investments in private enterprises in Cuba and direct the profit of such activities back into the Fund for further investment; no dividends will be paid out. This will ensure that the operation is truly not-for-profit and that any profits will be used to further the mission of the Fund. Upon the liquidation of the Fund, all monies should be directed toward the creation of an endowment to continue to assist the Cuban people in a manner directed by the Board of the Fund. The creation of the Polish-American Freedom Foundation out of the liquidation of the Polish American Enterprise Fund can serve as a good example of the way in which this can be managed. The Cuban Enterprise Fund would also provide technical assistance to directly support Fund investments. This technical assistance would focus on training and educating management and employees of invested companies to provide them with the skills necessary to ensure the success of their businesses. Technical assistance costs would be managed from a separate account other than the Fund’s investment capital. The Cuba Study Group recommends that funding institutions allocate an additional $15–$20 million, separate from the Fund’s investment capital to fund technical assistance programs. The role of the Cuba Study Group would be to prepare the proposal and seek the cooperation and commitment of the prospective donors, as well as lend the experience and expertise of the Cuba Executive Corps (the mentorship initiative created for the Cuba Study Group Micro-loan initiative) for future training and mentoring of Cuban entrepreneurs. The Cuba Study Group would not be responsible for funding, managing, or staffing the Cuban Enterprise Fund or directing the type of investments the Fund directors make, nor will any of the Cuba Study Group’s members or staff profit in any way from the Fund. 1. Birkelund, John P. “Doing Good While Doing Well.” Foreign Affairs 80.5 (2001): 14–20. 2. U.S. General Accountability Office. Enterprise Fund’s Contributions to Private Sector Development Vary. Washington: GAO, 1999, p. 4. 4. U.S. General Accountability Office, p. 21. 8. Commission for Assistance to a Free Cuba, Report to the President, July 2006. 10. Ibid, pp. 80–81, 87.